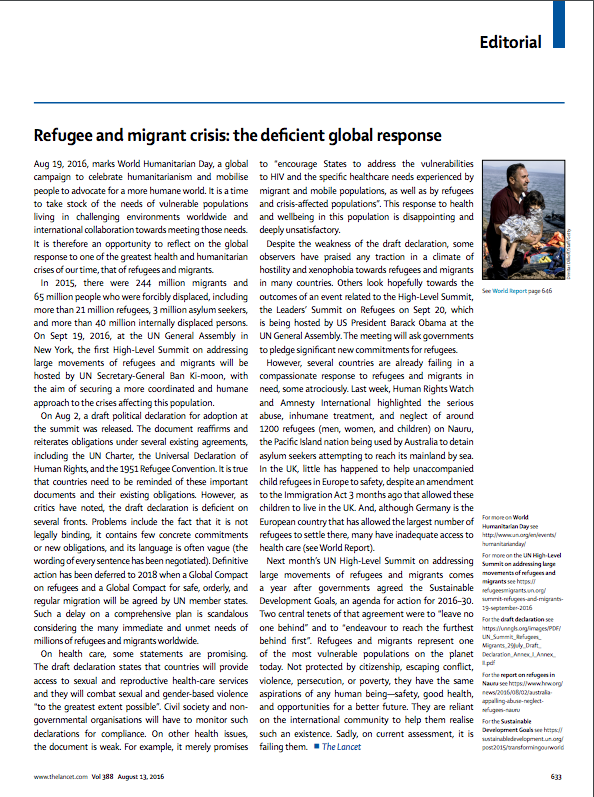 The Lancet, Editorial – Aug 19, 2016, marks World Humanitarian Day, a global campaign to celebrate humanitarianism and mobilise people to advocate for a more humane world. It is a time to take stock of the needs of vulnerable populations living in challenging environments worldwide and international collaboration towards meeting those needs. It is therefore an opportunity to reflect on the global response to one of the greatest health and humanitarian crises of our time, that of refugees and migrants. In 2015, there were 244 million migrants and 65 million people who were forcibly displaced, including more than 21 million refugees, 3 million asylum seekers, and more than 40 million internally displaced persons. On Sept 19, 2016, at the UN General Assembly in New York, the first High-Level Summit on addressing large movements of refugees and migrants will be hosted by UN Secretary-General Ban Ki-moon, with the aim of securing a more coordinated and humane approach to the crises affecting this population. On Aug 2, a draft political declaration for adoption at the summit was released. The document reaffirms and reiterates obligations under several existing agreements, including the UN Charter, the Universal Declaration of Human Rights, and the 1951 Refugee Convention. It is true that countries need to be reminded of these important documents and their existing obligations. However, as critics have noted, the draft declaration is deficient on several fronts. Problems include the fact that it is not legally binding, it contains few concrete commitments or new obligations, and its language is often vague (the wording of every sentence has been negotiated). Definitive action has been deferred to 2018 when a Global Compact on refugees and a Global Compact for safe, orderly, and regular migration will be agreed by UN member states. Such a delay on a comprehensive plan is scandalous considering the many immediate and unmet needs of millions of refugees and migrants worldwide. On health care, some statements are promising. The draft declaration states that countries will provide access to sexual and reproductive health-care services and they will combat sexual and gender-based violence “to the greatest extent possible”. Civil society and non-governmental organisations will have to monitor such declarations for compliance. On other health issues, the document is weak. For example, it merely promises to “encourage States to address the vulnerabilities to HIV and the specific healthcare needs experienced by migrant and mobile populations, as well as by refugees and crisis-affected populations”. This response to health and wellbeing in this population is disappointing and deeply unsatisfactory. Despite the weakness of the draft declaration, some observers have praised any traction in a climate of hostility and xenophobia towards refugees and migrants in many countries. Others look hopefully towards the outcomes of an event related to the High-Level Summit, the Leaders’ Summit on Refugees on Sept 20, which is being hosted by US President Barack Obama at the UN General Assembly. The meeting will ask governments to pledge significant new commitments for refugees. However, several countries are already failing in a compassionate response to refugees and migrants in need, some atrociously. Last week, Human Rights Watch and Amnesty International highlighted the serious abuse, inhumane treatment, and neglect of around 1200 refugees (men, women, and children) on Nauru, the Pacific Island nation being used by Australia to detain asylum seekers attempting to reach its mainland by sea. In the UK, little has happened to help unaccompanied child refugees in Europe to safety, despite an amendment to the Immigration Act 3 months ago that allowed these children to live in the UK. And, although Germany is the European country that has allowed the largest number of refugees to settle there, many have inadequate access to health care (see World Report). Next month’s UN High-Level Summit on addressing large movements of refugees and migrants comes a year after governments agreed the Sustainable Development Goals, an agenda for action for 2016–30. Two central tenets of that agreement were to “leave no one behind” and to “endeavour to reach the furthest behind first”. Refugees and migrants represent one of the most vulnerable populations on the planet today. Not protected by citizenship, escaping conflict, violence, persecution, or poverty, they have the same aspirations of any human being—safety, good health, and opportunities for a better future. They are reliant on the international community to help them realise such an existence. Sadly, on current assessment, it is failing them.